"I was trying not to limp at the Trials. I overdid it the week before. I had this one workout the week before that I thought was going to be a pinnacle. My foot started to get tired and I didn't listen to it. I was running one of the best workouts of my life, and I should have stopped." "It's hard for a runner to get it into her head that this workout doesn't matter. You measure yourself sometimes based on your workouts, but I'm beginning to realize -- and you think I would have realized it a long time ago -- that it doesn't really matter what you do in practice. No one sees that. No one cares. It's important, yes, but it's what you do when you get to that race [that counts]. I've been leaving it too much at practice. I didn't show [at the Trials] how hard I'd been working because I was in pain ... I was very upset afterwards. You want to be able to do everything you can, and if you don't make it, at least you gave it your best shot. I didn't feel like I was able to, and it was hard. But I learned a valuable lesson from that. I'm 30 now, but the lessons still come!" - US 20k champion Renee Metivier Baillie explaining her disappointing performance at the Olympic Trials this year and giving out some free coaching advice in the process. She had ran a 15:28 in early June, so was definitely someone in the running to go for the "A" standard at the Trials, but with her injured foot she didn't even make the final. Why do Ritz and Teg Run Marathons? Just got transfered to Beijing for two years. Should I kiss my running goodbye? Could Usain Bolt break 40 for 10 miles? How can elites run 26.2 miles at well under 5 pace and I struggle to run one at that? How does one train to get legs like these?! The Oldest Road Race In Europe: Olympic 10,000 Bronze Medallist Tariku Bekele Wins The Giro di Castelbuono 10k 5000 Bronze Medallist Thomas Longosiwa was 2nd. Ezekiel Kemboi was a very distance 4th place. UCI Still Waiting On USADA For Details Of Lance Armstrong Lifetime Ban UCI President Pat McQuaid: "The dossier which USADA has certainly prepared will allow for clarification on points which remain open in this affair ... The UCI does not intend to appeal, but we need verification". Pat Price, Of The Website Writing About Running, Shares His Experience With Plantar Fasciitis And The Cortisone Shot That Cured It All Unfortunately, this article came out a few months late to save Ryan Hall. Podcast Interview with Daniel Gordon, Director of the Film 9.79* The ESPN documentary is about the 1988 men’s Olympic 100 meter final which involved Carl Lewis and disgraced Canadian sprinter Ben Johnson. Spanish Sports Federations Face Hefty Subsidy Cuts This doesn't bode well for a country that failed to win a single track medal in either the 2008 or 2012 Games. Maybe The Sympathy Was Lost In Translation? Nigerian Coach Explains Why Blessing Okagbare Didn't Medal Coach Igwe: "It's pity that Okagbare did not win a medal at the Olympics. The main reason is that so much was expected from her and at the end of the day she failed all of us, everybody had tipped her to win a gold medal for Nigeria but she never did." Valerie Adams Receives Custom Made Chocolate Gold Medal In Switzerland From Her Coach Talking about the Games when she thought she lost: "It was hell. It was stressful. I was very, very upset and depressed. I wanted to give more. I felt so disappointed and felt like I had let my country and family down." Physiotherapist And Athlete Support Services Coordinator Neil Black Takes Over As UK Athletics Performance Director This was not Charles van Commenee's position as there was no performance director since 2008. But Black will choose the new head coach. Van Commenee Insists That Not Hitting The Medal Target Is The Only Reason He Is Leaving The Position "I have said from day one that if you don't hit targets there are consequences. I've just done what I said. I had no choice." 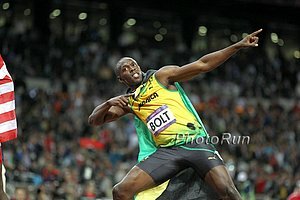 Usain Bolt Says He Will Defer His Wild Card Entry Into The 2013 World Champs To Yohan Blake Bolt as the 2012 DL winner and Blake as the defending World Champ are both eligible for a wild card spot, but each country is only allowed one wild card per event. 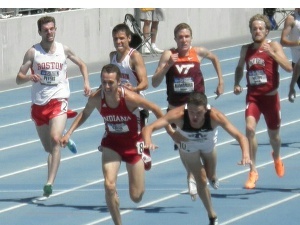 Bolt will probably still get one in the 200 over DL winner Nickel Ashmeade. 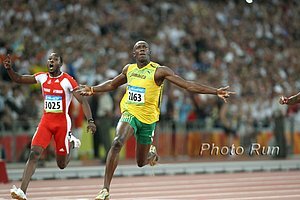 West Indies Cricket Player Chris Gayle Says He's Played Against Usain Bolt And He's Good Gayle: "He wouldn't embarrass himself. In a charity game, he actually played against me and almost knocked my head off." 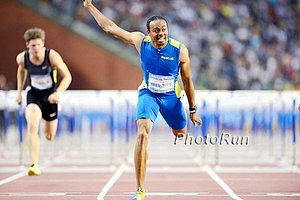 Veronica Campbell-Brown Post-Olympics Blog She reveals she had a "medical challenge" that hurt her performance in London. Reid Coolsaet To Return Pacemaking Favor To Kenyan Stephen Chelimo When He Runs The Toronto Waterfront Marathon On Oct. 14th Chelimo paced Coolsaet through 34k in his PR race and now Coolsaet will pace Chelimo in his debut. How Much Do Top US College Track Coaches Make? Terms Of Vin Lananna And Robert Johnson's Contracts Released Lananna: $289,855 plus an "additional $234,105 annually in deferred compensation". Johnson: $150,000 and a guaranteed supplemental salary of $125,000 ... plus perks and bonuses. 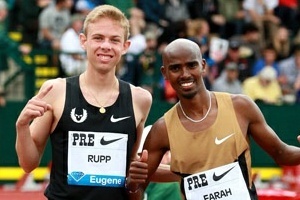 A Look At The Leading Contenders For The 2012 BMW Berlin Marathon Who can challenge Geoffrey Mutai on September 30th? LRC US Records For 24-Hour Run Fall Go run sub-8:21 miles for 24 hours straight. Very impressive. The women's record is 9:37.3 per mile. 20-Year-Old Ethipian Atsedu Tsegay, Who Ran 58:47, Will Go For WR And Compete Against Lelisa Desisa, & Deriba Merga At $250,000 Airtel Delhi Half Marathon At End Of Month Meet website here. 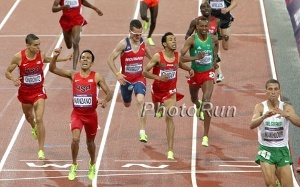 Rieti Results Taoufik Makhloufi won the 800 in 1:43.74, Silas Kiplagat dominated the 1,500 as Andrew Wheating disappointed, Collis Birminghman won the 3k as Olympic steeple champ Ezekiel Kemboi and German Fernandez disappointed. Burundi youngster Francine Niyonsaba got her second win in three days over Olympic champ Mariya Savinova in the 800. Vivian Cheruiyot got the best of Sylvia Kibet in the 3,000m. *IAAF Recap Of Rieti Valerie Adams had three throws over 20m. 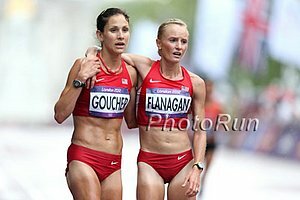 Kara Goucher Blogs About What's Next She's doing Boston in April, but taking the fall to drop the mileage (from 120's to 90's) and focus on her "neglected" speed. Dawn Harper Serves As "Honorary Team Captain" For Coin Toss At Rams-Redskins Game On taking a break she said, "I'm on break now, and I'm kicking back. I told myself, 'I am not running anywhere. I'm not running across the street. I'm not jogging anywhere. I'm on break.'" Good RW Interview With Renee Metivier Baillie Who Won The US 20k Champs At New Haven And Will Make Her Marathon Debut At Chicago "I have a degree in mathematics. I could be making more money doing something else, but this is what I love. And I'm happier doing this. Even struggling through the years of injuries, I'm still happy. Because I love it. And I don't want to give up. I believe I have places to go." German Distance Runner Sabrina Mockenhaupt Wins German 10,000 Title Easily She's shooting for a top 10 finish at the World Half-Marathon champs. Yohan Blake Shares Interesting Thoughts On The US/Jamaican Sprint Rivalry And Says Jamaica Will Be Dominant "until the day that we all leave the earth." 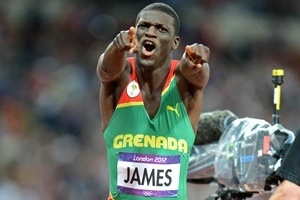 Talking about US sprinters, he says, "We don't really have a relationship. We say 'hi' and 'bye', because they hated us, they totally hated us because of our exploits and because we can run and we can have fun and because of our dominance." 110H Bronze Medallist Hansle Parchment Says He Wants Gold In 2016 Aries Merritt will be 31 there and Parchment only 26, so who knows. 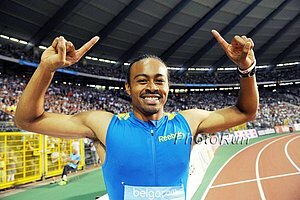 Aries Merritt And Other US Olympians Meet The President In Washington DC Merritt: "In previous years, I would be so, so nonchalant about everything. I took everything for granted. I didn't work hard. I just thought talent would carry me. Hard work beats talent when talent doesn't work hard. I decided I was going to work hard, change my diet. All of these things played a role in it; it wasn't just one thing." Lolo Is Solo: Lolo Jones Denies Reports That She's Dating Ndamukong Suh "We are not currently dating. However, if the Lions win the Super Bowl and he wants to use the ring to propose to me, then we'll see." Mo Farah's Twins Get Personalized Shoes, Blankets And Gold Medals Farah has reportedly said he's going to engrave each of his gold medals with one of the twins names on them. Daughter Of Founder Of Paralympics Against Merger With The Olympics On Oscar P running in the Olympics, she said, "Whether it is a good thing I do not know. I think it may possibly be. That Oscar did not win [an Olympic medal] was fine in a way because had he won I think then there would have been discussions 'did he have an advantage'." 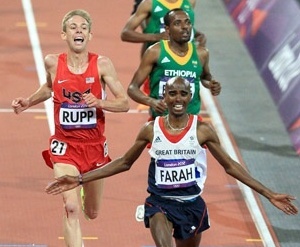 NBC's CEO Defends Olympic Spoilers Being On The News Our advice for 2016: get a UK proxy and watch everything on BBC. 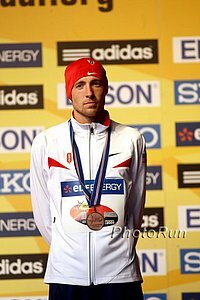 He Should Hire John Kellogg: After A String Of Bad Injuries Which Have Left Him Unable To Train, Ryan Hall Is Considering Getting A Coach "I've said since I started the faith-based coaching thing, I've been open to working with a coach. This wasn't something I was married to for the rest of my career or anything like that." Good Running Times Article On A Little Known '84 Olympian John Tuttle, Who's Still Tearing It Up On The Masters Scene Tuttle: "I want to be as good as I can be, for as long as possible. I'm always going to run. And if I'm going to run, I might as well race and try to be up near the top." RW Brief Chat With Hansons Runner Dot McMahan Ahead Of The Chicago Marathon She finished top 10 in both the 2012 and 2008 Marathon Trials. US 800m Runners Phoebe Wright And Erica Moore Document Part Of Their 6-Week, 7,200 Mile Road Trip In Photo Essay They've started a website, Runnin' The Streets, to show the non-athletic side to the life of an athlete. *Somebody Stole "Armstrong's" Bikes They were worth nearly $60,000. Athletics Kenya Announces That All Kenyan Marathons Must Give At Least $5,954 To Race Winners AK boss Isaiah Kiplagat: "There is really no need for people to go out there getting sponsorship, putting money into their pockets and you pay a man who has ran 42km Sh150,000 that is a joke!" Better news is they're requiring drug testing, too. Luke Puskedra Has Realized He Loves To Run On The Roads - Looking Forward To World Half Champs "I really enjoy going out and doing more of the tedious-type stuff. Just stuff where I can turn my head off and get the work done." 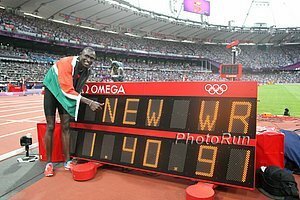 Kenyan Sports Minister Rips Olympic Report That Placed Most Of Olympic Blame On Athletes (link fixed) He wants a new report - "That will be a far much more enriching a report to the republic rather than stating that so and so fell sick, so and so woke up on the wrong side of the bed or so and so din't look at so and so properly. That is not what we are looking forward to." Ridiculous: Oscar P Is Shortlisted For Paralympic Sportsmanship Award Days After Nearly Being Disciplined For Whining It is given to one "who is fair, honest and is uncompromising in his or her values and prioritises the promotion of the Paralympic Movement above personal recognition." Oscar Pistorius Dominates To Win Final Track Gold His time was 46.68, which was a slow time for Oscar but a Paralympic record. Pistorius won by nearly three seconds and this was his first individual gold in London. 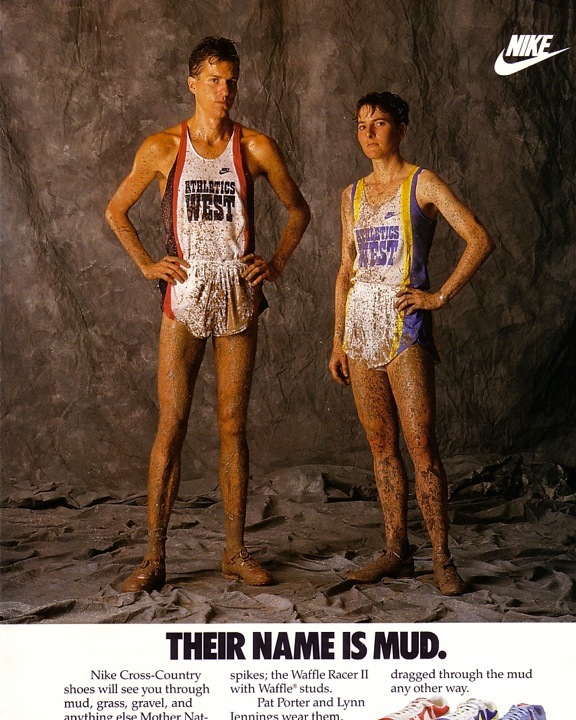 LRC High School Team Dominates in LetsRun.com T-Shirts If you're going to run fast you should also look good doing it. That's what the Blue Valley Northwest XC team did in Topeka, Kansas as they sported their new LRC tshirts and swept four of the top 10 places last weekend. With Wejo no longer competing, maybe we should sponsor them. 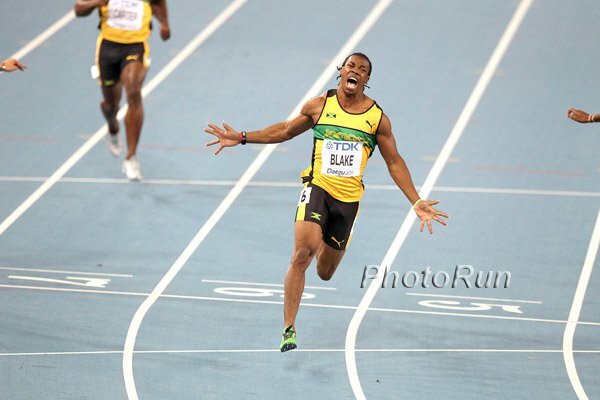 Yohan Blake Would Love To Quit Track To Play Cricket Full Time Blake: "With this hard training in track and field and I know that cricket training is not that hard and I can make the team and it is my first love, I would go to play cricket. I want to finish this (athletics) as early as possible, so I can play my cricket; like somewhere around 30, 29, 28, in that region." HS: Amy Eloise Neal 16:31 5k!!!!!! 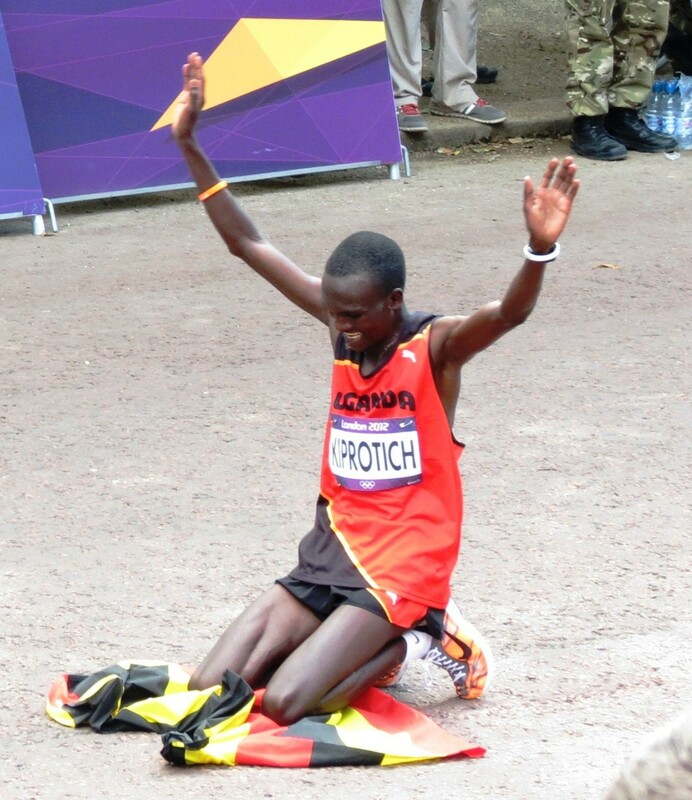 Upcoming: Renato Canova-Coached 2:07 Man John Kiprotich Added To October 14 Scotiabank Toronto Waterfront Marathon Field He'll add to those chasing the $25,000 bonus for breaking the 2:07:58 CR. NYRR Talks To Alisha Williams In The Buildup To What Will Be Her 2nd Marathon At NYC Williams debuted with 2:35:09 at the Trials for 14th place and also works a full-time job as an accountant. LRC NCAA Cross-Country Pre-Season Polls Sure, the NCAA XC season is underway but nothing has happened yet, so tell us who your top 10 teams are in the country or in each region. Need Coaching Advice? Coaches Of Jessica Ennis, Sally Pearson & Tafouk Makhloufi Among Speakers At International Festival Of Athletics Coaches Conf. In Glasgow October 26-28. Atami Yurakkusu Marathon Cancelled Because Organizers Say They "cannot ensure adequate evacuation routes in the event of a tsunami." NZ Admin Not Happy That Disgraced Shot Putter Nadezhda Ostapchuk Might Get Off With A Shorter Ban NZ chief exec said the notion Ostapchuk's coach "dusted her food" with the anabolic steroid metenalone is "hardly credible" adding that "some people fall on their swords to protect others." Valerie Adams To Get Her Gold Medal Next Week At least she didn't have to wait 3 years like Nick Willis did for his 1,500 silver from Beijing. Adams Says She'd Be Game For A Boxing Match Against Ostapchuk After False Rumors Were Spread That One Was Being Organized Adams also doesn't buy that Ostapchuk's coach doped her. 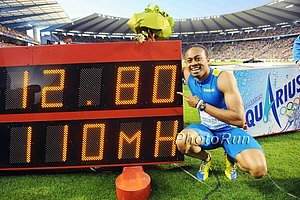 Hearing For Suspended Head Of South African Athletics Will Go Ahead The original hearing was postponed after SAA's offices were broken into and computers stolen. Boston Marathon Runner-Up Sumgong Jemimah Jelagat Cleared Of All Doping Charges She had received a local (intrabursal) injection of Prednisolone, which is allowed. Unbelievable: Shot Putter Nadezhda Ostapchuk Was Allegedly Secretly Doped By Her Coach - Who Spiked Her Food - As He Was Worried About Her Unimpressive Results Prior To London The coach has confessed and as a result Ostapchuk, who vehemently denied she doped, was only given a 1-year ban. Her coach is out for 4 years (he should be out for life). *RR: Longer Article With Many More Details On Ostapchuk Doping Investigation The Belarus federation even drug tested staff members to see if they somehow contaminated Ostapchuk. *Interesting: Ostapchuk's Coach Also Worked With 2000 Olympic Champ Who Was Busted In 2003 And He Said Then Maybe Someone "Poured Something Into Her Glass." THE 41st DAY Update from Tim Jeffreys on Vimeo.